Welcome all! Maybe you’ve just stumbled upon this site, or possibly it came up in an active search for handcrafted leather goods. Either way, thank you for visiting the site and taking the time to check out this blog and the products available. Leather is a relatively new passion for me–at least in creating items from it. I’ve always been a big fan of leather jackets and shoes. My current love affair with the medium began in the late spring of 2017 when I desired to make my own quiver, and disliked many of the ones I saw available as they were made of synthetic materials, or very expensive real leather with little character or uniqueness to them. I made my first quiver out of the sleeve of an up cycled 1970’s suede jacket. It worked, but was rather flimsy. Thus began my quest to craft a quiver. 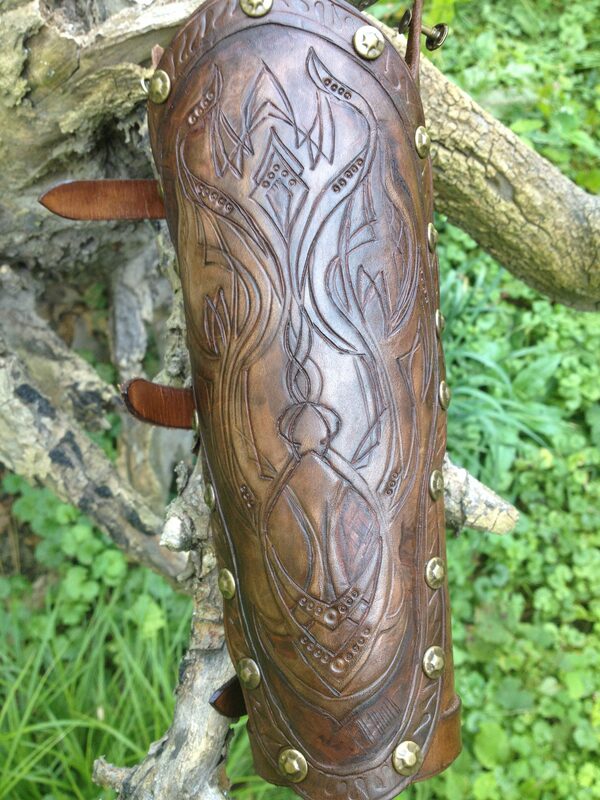 Which lead to creating an armguard (pictured above). Which lead to making bracers. Which lead to making bracelets. And bags. And belts. Then, a leather corset, which I wore to my “local” Renaissance Faire to many compliments and rave reviews. The answer at the time was, appallingly, no. But that’s changed. I’m making a lot of my smaller unique items available at any time right here on this website, and am open to crafting custom items. If you’re interested, take a look at the shop or at the gallery. Thanks again, and hope you enjoy browsing the site!